We recently rode and tested the Cake Kalk, the company’s first off-road bike. 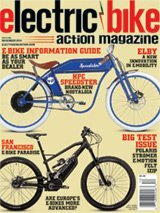 It’s an e-bike that rides like a motorcyle (footpegs and a throttle) but is largely based on downhill mountain bike components, weighing in at a reasonable 143 lbs. The new bike, called the Kalk& (and), is visually identical to the off-road version, save for lights, signals, and street tires. There have been some tweaks to the chassis, and the motor, gearing and programming have been tweaked for less torque but higher speeds, able to go over 100kph. The bike is street-legal in the U.S. and the E.U. The bike has just been announced, and the company will start taking pre-orders in March, 2019.